“I’m delighted that John has been in contact with the PFBC Archive, also for myself as Archivist to receive an image of the Qantas Certificate. Both the Hythes & Sandringhams had been RAF military Sunderlands in WW2 + adapted to carry Pax: Sandringhams were better conversions. The prefix RMA was used to denote the carriage of postal consignments: Royal Mail Aircraft! and service handed over on the Kangaroo & Dragon Routes to Landplanes. As Poole had ceased its role as a BOAC Marine Terminal by 1st April 1948 and flights had been switched to the new facility of Southampton’s Berth 50, it could signify that this might have been the Return Journey, or possibly the outward series of flights which were sometimes broken to allow Pax to spend time in ports-of-call along the way ~ such as at Augusta in Sicily, or Cairo etc. There is a lovely example of this ‘breaking of a trip’ in Francis Durbridge’s < Paul Temple and the Sullivan Mystery > involving a Poole Flying Boat (! ), where one character refers to ‘taking time out in Singapore en route to Oz’. 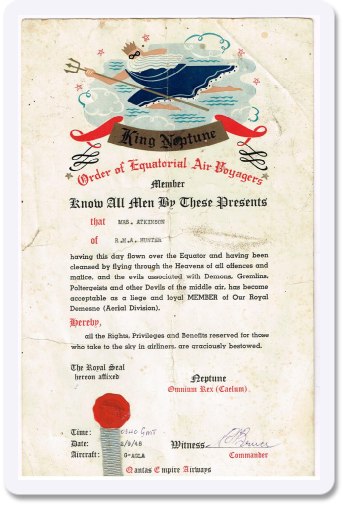 Such certificates, just like the ones issued on the Springbok route to S. Africa, are a lovely keepsake and a reminder of splendid passage by Flying Boat and Ship! Sadly Mrs Atkinson passed away on 4th September 2012; we send our heartfelt condolences to the family she leaves behind.